The reaction in Vegas at the time of Oklahoma's TD must have been interesting. There was already plenty swinging on the outcome of Bedlam. If Oklahoma State won, the Cowboys would earn the Big 12 title and a berth to the Fiesta Bowl. If Oklahoma won, the Texas-Baylor game would suddenly become important, with the winner earning the Big 12’s automatic BCS bid. The Sooners, with a great second-half effort from quarterback Blake Bell, beat the Pokes 33-24. And something else also swung on the outcome: the over/under. 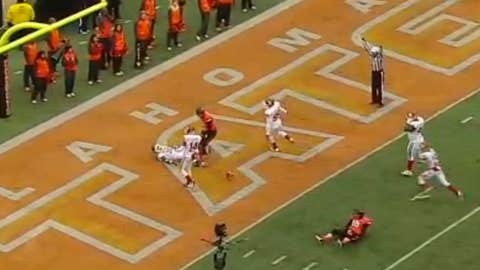 As Oklahoma State tried to lateral the ball around on the final play, it ended up going backwards into its own end zone. Oklahoma fell on the touchdown. Watch the play here. The six points pushed the Sooner victory magin to 33-24, seemingly harmless, right? The over/under on the game closed at 56.5 points. The tough math means that final meaningless touchdown boosted the point total to 57, so you either cash or crash.